As I said baking simplified, but you might call it as well lazy baking. Because this is the sort of perfect recipe to make when your imagination has left you. Those times, when all you want to be is a couch potato, and just the thought of scooping cookie dough feels like climbing Mt. Everest. I top it off with a scoop of coconut whipped cream, and it was awesmazing. No seriously, it was so rad I could have eaten all by myself. If you don’t have a cast-iron skillet, you have to get one because you need one. You can get a pre-seasoned 6.5-inch skillet for about $11 or a 3 piece skillet set for $25. I use my cast iron pans all of the time from cooking eggs, to making hash and sauteing chicken to making cookies. So what’s holding you back? Buy one or take yours out from the cupboard and make this awesmazing cookie! 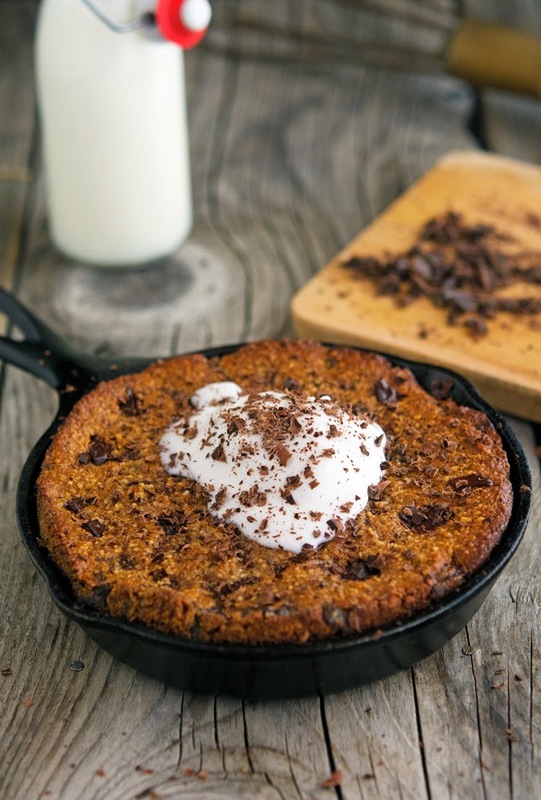 (Paleo) Skillet Chocolate Chip Cookie with Coconut Whipped Cream Print this recipe! Preheat oven to 350°F (175°F) and place a rack in the middle. Grease a 6.5-inch cast iron skillet. Set aside. In a bowl, combine almond flour, baking soda, and salt. Add chocolate chunks and stir to combine. In another bowl mix egg, honey, melted coconut oil, and vanilla extract. Cover with plastic wrap, and refrigerate for at least 30 minutes. Fill the cast iron skillet evenly with the dough. Refrigerate until ready to serve. The whipped cream will become thicker as it chills in the fridge. One serving yields 313 calories, 25 grams of fat, 18 grams of carbs, and 8 grams of protein. This sounds fantastic Mike and the ingredients are nothing to what come out after baking. Wow, beautiful photos. P.S. I never knew they sold pre-seasoned pans, might check out the link myself (thanks Santa!) and get a small one! You need to share this Sam, it's mandatory! I've literally got a skillet on my Boxing day sales hunt list (our version of black Friday). I love all these skillet recipes and this is no different. I could faceplant it. (when it has cooled down). You need to get a cast iron skillet asap man, it's a must, must, must! Yum!!! 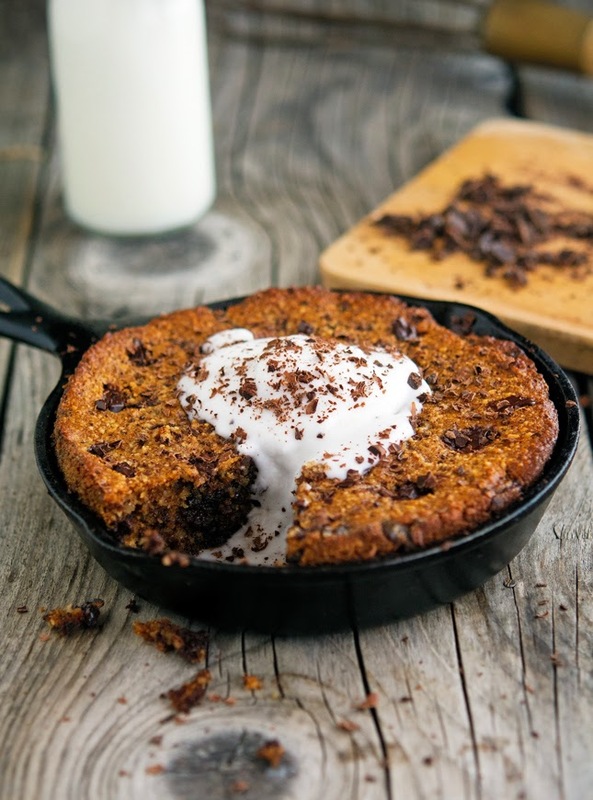 I love skillet cookies - so much crispy goodness! :) Didn't know you could buy pre-seasoned skillets, thanks for the great tip! Skillet cookies are the best, I never get tired of 'em! 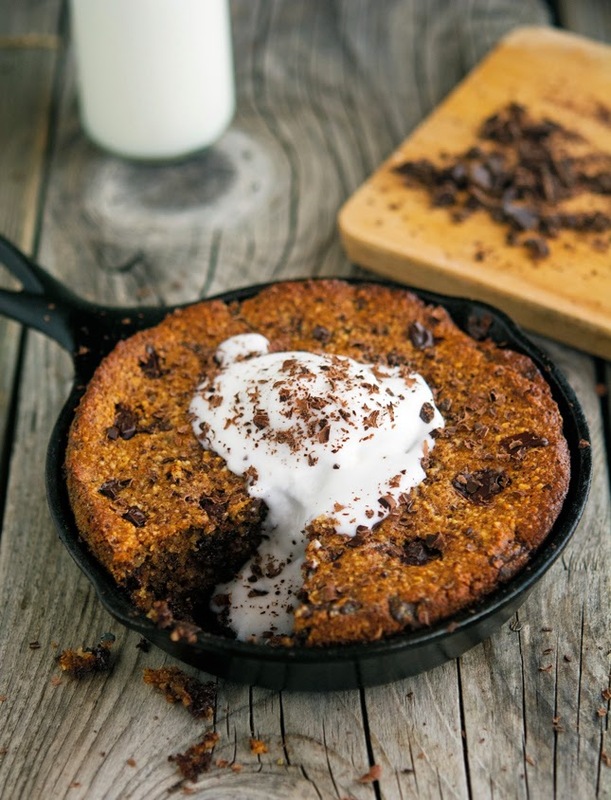 This chocolate chunk skillet cookies is seriously all I am craving right now, delicious and inspiring recipe Mike! HI Mike, like the 3 steps of this recipe, looks delicious! Oh MY GAWD this looks so good! I was sad to see that it serves 4 haha. You could totally make a mini version for ONE by dividing up the recipe, I have mini skillets like this as well. Definitely going to give this a shot! I need to buy me some single serving cast iron skillet too, they're so much fun! I like this kind of dessert. Simple, tasty and no hidden calories. Baking simplified or lazy cooking, this one is a winner in my book. This a OMG dessert. Looks divine. I've wanted to make coconut cream for a while, I'm on it. Whipped coconut cream is THE shiz Asha, you should totally try it! I would not call it lazy at all! I think it's super creative and ingenious, and you deserve a pat in the back! OOh - Awesmazing is THE only way to describe this delicious gigantic cookie!!! And in one skillet???!!! 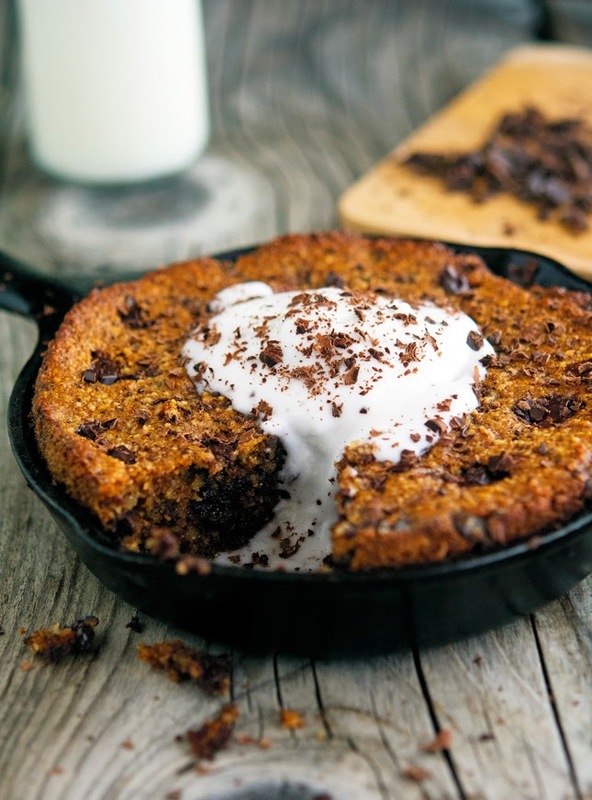 It's recipes like this that make me so happy I have a small cast iron skillet - cause my daughter and I WOULD eat the whole dang thing - specially seeing it's made with almond flour and all! 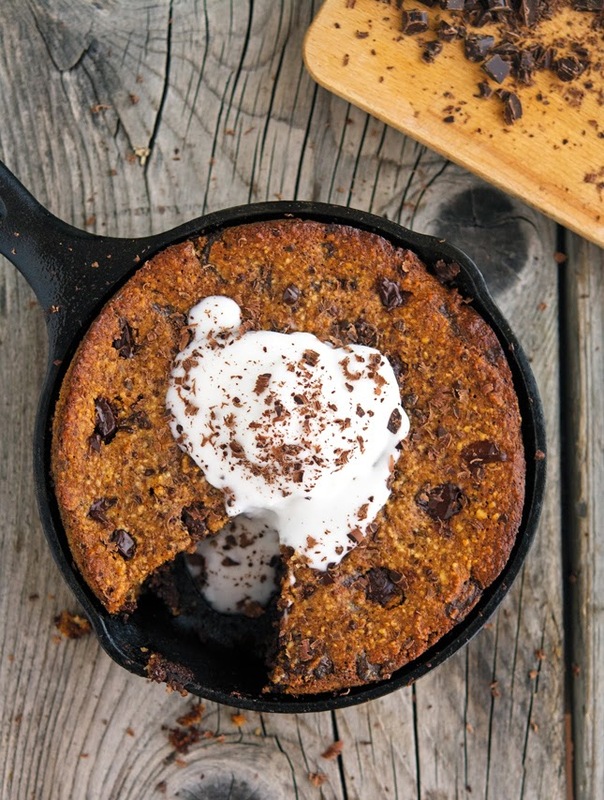 You need to get on board with skillet cookies, they're the best! I cannot get over how delicious this looks, especially that coconut whipped cream melting so delightfully on chocolatey goodness. Dude, it's so healthy you have no idea and you can most definitely eat the whole thing! This looks like maybe it's almond meal rather than almond flour? The flour is so fine and silt like and this appears more coarse. Just want to make sure before I make it. Thanks.